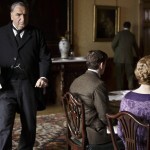 Downton Abbey is the smash-hit ITV drama series about those who live in the grand Downton Abbey. The noble Crawley family and their servants both struggle through family difficulties and deal with the social and political influences on their lives. Following on from the dramatic Christmas 2012 episode, the fourth series sees the family struggling to deal with tragedy, but when Lady Mary’s gives birth to a new generation bringing joy and hope, the family take a step into the Roaring Twenties. The ever popular series is created by Julian Fellowes (Vanity Fair, ITV’s Titanic) and boasts a spectacular cast of award winning actors, including Maggie Smith (Room with a View, Gosford Park), Hugh Bonneville (Tomorrow Never Dies, Notting Hill), Michelle Dockery (Anna Karenina, Hanna), Brendan Coyle (The Raven, The Jacket), and Elizabeth McGovern (Once Upon a Time In America, The Handmaid’s Tale). The Downton Abbey team visited The Historic Dockyard Chatham in February 2013 where they used the Tarred Yarn Store to double as the workhouse where Mr Grigg (Nicky Henson) works in episode 1 and in episode 2, streets at The Historic Dockyard Chatham were used for the scenes where Lady Rose MacClare (Lily James) is at the market with James Kent (Ed Speleers) watching her. The Historic Dockyard Chatham is a popular film location due to its varied and interesting areas such as the cobbled streets, church and over 100 buildings dating from the Georgian and Victorian periods. Previous productions that have shot here include Les Miserables (2013), Call the Midwife (2012), and The Golden Compass (2007). Series 4 of Downton Abbey was shown from September 2013 and is now available to buy on DVD. This entry was posted in Filmed in Kent and tagged Brendan Coyle, Downton Abbey film locations, Elizabeth Mcgovern, feature film, Hugh Bonneville, Maggie Smith, Michelle Dockery, The Historic Dockyard Chatham. Bookmark the permalink.